artwork to make clear how it was supposed to look. “It’s an object that’s locally important, it was in really bad condition and it was something that not only could we stabilize, which is our first priority as conservators, but we could also make it aesthetically look like it once did,” she said. The sign, which will be displayed permanently at the museum, is part of a larger Robert Gilder exhibit that will be on display at the museum through Saturday. The overall exhibit includes Gilder art works and artifacts borrowed from Creighton University, the University of Nebraska-Lincoln, the Joslyn Art Museum and the Omaha World-Herald. The museum is located at 2402 Clay St., in Olde Towne Bellevue. 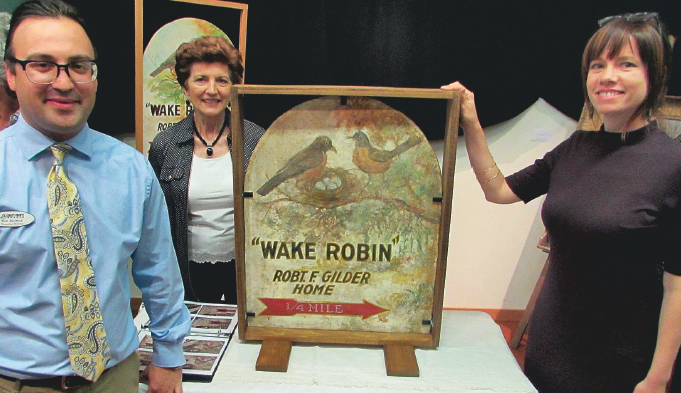 Ben Justman, executive director of the Sarpy County Museum, poses Thursday evening with the freshly unveiled and newly restored Wake Robin sign that once directed visitors to Robert Gilder’s Fontenelle Forest art studio. 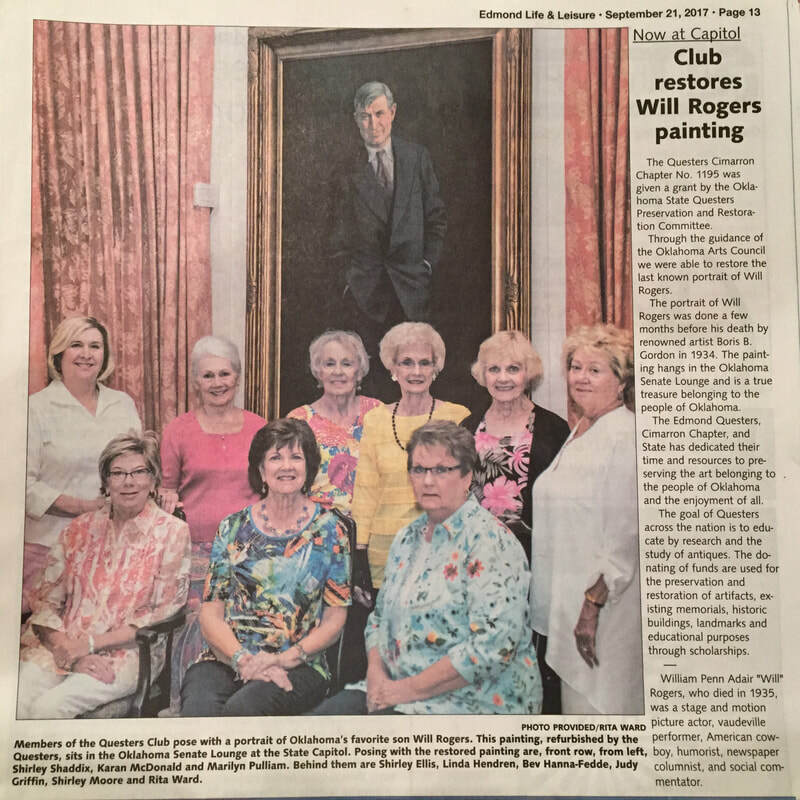 Pictured at right is Rebecca Cashman, of the Gerald R. Ford Conservation Center, who restored the artifact, and, at rear, Bellevue resident Lorraine Jeffus who serves as international president of The Questers, which financed the restoration. ‘Antiques on the Square’—the popular event held semiannually on the downtown Prescott Courthouse Plaza—has a new name and a new larger venue. It is now the Prescott Antique Show and Vintage Market and its upcoming event will be held at the historic Prescott Rodeo Grounds on Sunday, June 3.
that hangs in the Oklahoma State Capitol. The painting was completed just months before Will Rogers died. Taken from the Edmond Sun's "Edmond Life and Leisure" Section, September 21, 2017. SCOTTSBLUFF — Panhandle residents who are interested in preserving and restoring the past for the benefit of the future can join one of the local chapters of Questers and share your love of history, collecting and educating others. Questers is an international organization which hosts educational programs, speakers trips and workshops centered around the preservation and/or restoration of historical pieces and/or places. The organization is active in the Panhandle, boasting three chapters — Dome Rockers, Scotts Bluff and Scotts Girls. Current Nebraska State President Sandra Strey is the first Quester from the Panhandle to serve in that position. The organization and its members are interested in history and believe in preservation of everything from paper to buildings. Previous talks have covered antique leather books and postcards. Strey said she never thought the book talk would be all that interesting, but she was fascinated at the workmanship required to produce such items. It’s not all serious. Strey said it is also a lot of fun. Strey also became an expert on several new historical items. “It was a learning experience, but I was fortunate that a lot of people would help me,” she said. “That was the most fun for me. We go on trips and see many historical items and historical sites,” she said. They have made trips to Fort Robinson and Fort Laramie. But one trip to Sioux County was particularly memorable for Strey. “The Agate Springs Ranch house was interesting,” she said. “A lot of it is empty, but there are a lot of little touches of history everywhere.” Locally, Questers obtained a grant to paint the windows at the West Nebraska Art Center. They are currently waiting to hear if they will re- ceive a grant for the coping, or wall capping, on the outside of the building. The Dome Rockers chapter, which Strey belongs to, helped in the moving of materials from the North Platte Valley museum to the Farm and Ranch museum as the two were merging into the Legacy of the Plains Museum. Statewide, Questers is waiting to hear about a grant for the Bess Streeter Aldrich home in Elmwood. Strey said. She has been pleased with the amount of work and support from the state for the many projects Questers is involved in. “Nebraska has been very progressive about helping our state,” she said. Strey became involved after she was invited by Ronda Lewis to a Spring Tea where potential new members can find out more information about the organization. Strey became one of the charter members of the new chapter, Dome Rockers. The names of chapters come from something in the area where the chapter is established. Each chapter has a minimum of eight people. Many keep about 15-20 in a chapter to keep the original idea of everyone fitting into one home intact. They have the flexibility to decide when and where they meet, but most meet from September to May. A member can also be an associate member in one other chapter. Strey said this happens more often when a new chapter is beginning, so other chapter members can help get the new one up and running until they can stand on their own. This display box was a regular fixture in many stores around the country. Customers could simply pull open a drawer, grab the piece of thread they wanted and go pay for it. With the clear fronts, customers could view what they needed before opening the drawer and having fewer hands touch the threads before one was purchased. This needle box is one of the unique items stored at the Legacy of the Plains Museum in Gering. It is one item that Sandra Strey, Nebraska Questers president, likes to show off because it is in excellent condition and nearly intact as it was when the needles were sold.